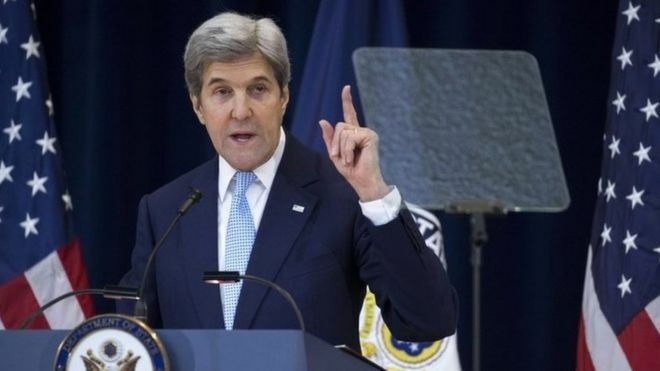 “Grave Danger” according to US Secretary of State John Kerry declaring that there possible will never be a successful cease-fire in the Israeli-Palestinian saga. Both countries have been locked in a never-ending battle for decades now, with no impending peace talk because both countries have refused to budge in this ongoing saga. A peaceful solution will finally bring peace to the region’s problem. Kerry also stated that the United Nation’s resolution to Israel and Palestine problem was in accordance with what President Barack Obama administration envisioned. However, Israel’s PM Netanyahu, dismissed Senator Kerry’s suggestion as rubbish, claiming that his discourse had always been centered around the illegal settlement of the Palestinian government. Benjamin Netanyahu had already reached out to US President-elect Donald Trump who had tweeted his support of Israel. Trump indicated that the United States of America would not idly sit by and permit the Isreali people to be treated disrespectfully by any meddling powers. However, on Friday, the USA abstained from a newly suggested solution by the United Nation Security Council. This resolution was met with furious reactions from the Isreali government. Both countries had been resolute in their stance with neither inclined to provide a solution for their problem. Additionally, Palestine and Isreal are combating each other on a Jewish settlement that is caught in the middle of the dispute. Each country accused the other of being combative and the obstruction to peace in their region. The settlement at the center of the dispute housed over 500,000 Jewish settlers from 1967 when Israel gained control of East Jerusalem and the disputed West Bank. The United States and several other countries have worked together with the UN Council in order to come up with an arrangement that both countries can agree to, but to no avail. For now, the problem will continue until Isreal and Palestine can sit down together and draft a plan that will finally bring peace to their region and its people. Previous PostChina Has A Grand Ambition For 2018 And 2020!